I need to apologize for my absence the last few weeks- I had been preparing for my family to go on vacation to Florida (12-hour drive from our home in VA) and then last week we were there, so I was a bit busier than usual. Our week was great fun- that is, until the end. That was when my littlest, who had turned 3 while we were there, started having trouble breathing. An Urgent Care visit turned into an ER visit, which turned into a hospitalization. Needless to say, it was stressful. We had to extend our trip to ensure we could bring her home healthy, and I spent Friday night sitting in a chair in the ER, Saturday talking to doctors and nurses and caring for my little girl, and Saturday night sitting in our van as we drove through the night to get home. When considering what to write about today, I realized how much writing is like therapy for me, and I need some therapy right now. So I decided to kind of decompress my emotional state through some writing, and I hope you'll understand. Persistent cough like an engine that won't start. Sparkly hazel eyes dulled to a half-close. Lying on the bed, eyes closed but chest heaving. Sleep brings no repose, no relief- she must be dreaming of running from monsters because she can't catch her breath. Wake her up. Scoop her up. Tiny heart galloping in a tiny chest, everything working so hard just for each…little…gasp. I have to save her from the monsters and my heart knows this. It begins to gather speed in the chase. Into the car. Traffic won't move. Where am I going? No familiar oaks or wood fences here…nothing but palms and stucco and mouse-eared signs. And traffic. So much traffic. Get to the clinic. Empty. Fill out this form. Give us ID. Wait. Take her to the ER. Moving through darkness now…searching for hospital lights. More palms. Sticky heat. Make the turn. Crowded. Chairs filling with people. They're all so big. So loud. She is so. so. small. Still gasping. They ask her to wear a tiny mask so she doesn't cough on anyone. Sit there. Listen. They write. Ask. Write some more. Can I take off the mask please Mommy? No, you have to leave it on while you're here. That's what they said. When I get home can I take it off? Yes, when we get home. Come back. What's going on? Can't you see? She can't breathe! She can't breathe. She's too small. Phone to ear we need a room she's working too hard to breathe kick someone out we need that room now. In the room, on the bed, shirt off, gown on, glowing toe measures her pulse which is making the machine make an angry beeping complaint at having to keep up with her tiny racing heart. When did this start? Any fever? Asthma? Has she been sick? Can't get that heart rate down. Monsters won't stop the chase. Another breathing treatment. Watch the heart rate…180…170…still too high. She sleeps. I sit. My chair with a millimeter of padding and two hard arms, like a tiny cage. I'm cold. Is she cold? I get us blankets. Doctor comes in, goes out. Nurse comes in, another breathing treatment, goes out. Her heart finally slows, but it comes at a cost. She's not getting enough oxygen. Put her on oxygen. But it's not enough. Doctor says it's all he can do. Time for her to go. Whenever she tries to get more comfortable the sharp stab of the IV snaps her back to confused frightened painful consciousness and I have to hold her arm and she doesn't understand why and she fights me and screams I want daddy. Me too, I want to say. Me too. As the sun starts to change the color of the shaded windows from dark gray to light I see them coming with my blurred vision, black shirts with colorful important-looking patches and crackling radios hanging at their hips. They bring a yellow-and-black-wasp-colored rolling bed that buzzes and changes height at the push of a button. Mom, you can lift her into the bed. Come on, princess. We're going for a ride. Giant black straps awkwardly placed across her tiny little body. Look, you're almost as tall as me on that cool bed! It's an adventure. It's fun. It needs to be just a fun adventure I tell myself. She can't know. She's too small. Into the ambulance, bump, bump, bounce, bounce, sway, sway, and we're there. Engine humming, smell of exhaust, sticky heat, sliding doors, cool, sleek hallway. Elevator, 6th floor, glass-covered city skyline out the window. Hospital meets Disneyland, purple room, smiling blonde nurses. So gentle. So kind. She's so small. They know. Pancakes and Lucky Charms for breakfast, soft bed, cartoons on the TV. Doctor kneels down to talk to us in soft, gentle tones. She might be able to go home today. Yes, please. Listen to her breathe. Listen some more. And listen again. Breathing treatment, mac-and-cheese for lunch, roll the IV cart down the hallway to the playroom where we play with a pretty pink princess dollhouse and we forget about being sick for a little while. Drink, drink, drink. Fluids so important- keeps the monsters away. Breathing treatment, chicken nuggets and French fries with ketchup for dinner. And now I can too. The official diagnosis was bronchiolitis, an inflammation of the bronchioles, which are part of the respiratory system. Basically, they said she caught some sort of virus which, for whatever reason (I'm guessing her body was just exhausted from the vacation we were having- she had very little sleep) caused an overreaction in her lungs. By the time we left to go home she wasn't even coughing at all anymore and she seems to be much, much better now! Oh my Kasey! Such a worrisome event! Where were you in FL? That's where I live. So glad your sweet pea has recovered. I would need to write about this too...it's help with the healing, somehow, doesn't it? I'm so sorry your little one had to endure all that. Nothing worse than a sick child. Heart wrenching. I didn't realize you were Florida, Mare! 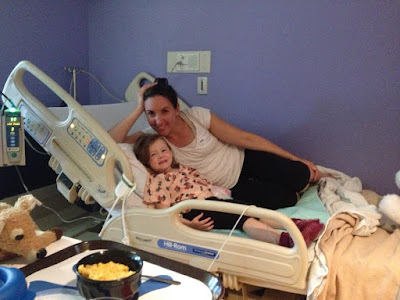 We were in Orlando, so she went to Arnold Palmer Children's Hospital. 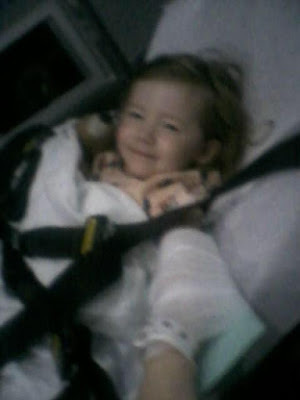 If she hadn't been released that day were were going to have to stay at the Ronald McDonald House there at the hospital. But we also had a very kind respiratory nurse who offered us a room at her house! :-) So many people offered to help. Yikes! So glad everything's better now! That must have been so scary.